So, you want beautiful free social media icons. It is a collection of 30 best free social media icons set. Every icon is unique in this list and these icons fits in almost every types of Blogs or website. All the social media icons is free to use for personal or commercial purposes. Hello! This is my second post on Social Media Icons. In my previous post I showed you how important is it to have social media icons in a Blog or Site. But it is quite impossible to find a good collections of Social Media Icons that will fit the blog. And you may not have much time to create a social icon yourself. In that case social media icons designer doe's great work in creating a beautiful icon set that will fit your Blog. But there is large number of designer who designs these social media icons. And you may also not get time to search the icon. So, I have collected 30 Social Media Icons from the designers' sites. These social icons look awesome. I also keep in mind that the designer keep their icons updated with latest social sharing sites so that you can get your desired social media icons set. Every icon is unique in this list and these icons fits in almost every types of Blogs or website. I really like these social media icons and that's why I am sharing these icons to you. Designers' loves to design icons and keep most of their icons free. Having a good social connect feature can increase your users. You should have make your Blog to look awesome and adding good looking social media icons in your Blog will make your Blog or Site to look more beautiful. All the social media icons is free to use for personal or commercial use. I have provided the link to the social media icon on the Download button below each icons image. If you like a particular icon than you can click on the download link to go to the download page of that social icon. Every link will be opened in a new tab. Page Peel is a free icon pack version 2. To download this icon set click on Download Icons below the preview image. This icons set is available in two sizes, 128x128 and 64x64 pixels. It comes in PNG format. Elegant Themes is very popular for WordPress Templates and it creates really beautiful designs. These sets of icons is designed by them. You can see the image given below to get the slight idea on how it looks. You can go to the designer site to know more about this social media icons or to Download this icon pack. Hand Written is a cute icon pack. These icons will look like as it is designed by hands. It will be great for art and craft sites. Have a look at the picture below. Here is another beautiful icons sets. 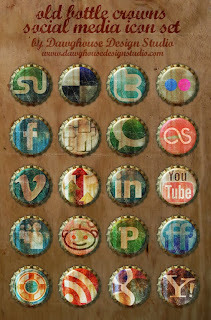 It looks like the social media icons is crafted on wood. It may not fully look like wood but it will really give a beautiful feel to your blog. The set contains 12 different icons of 420 x 420 px. It comes in PNG format. This icons set contains 15 good looking social icons. It is available in PSD as well as PNG format. It is little small in size with 72×72 px. If you like these icons than you can click on Download Icons button below to go to the official site to download these icons set. These are transparent looking social media icons with little glassy feel. It will look awesome in any type of Websites. Take a quick look at the icons in the image below. You will like these icons pack. It's beautiful collection of simple flat style icons. There are 35 icons available in this icon pack. It comes in PNG and PSD format. 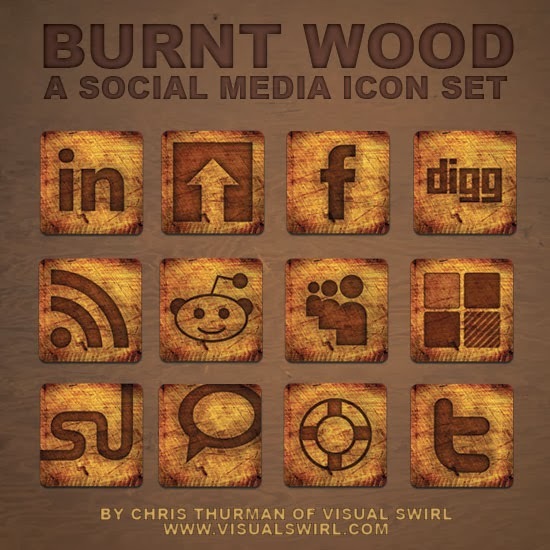 This set includes most of the popular social media icons. You can see the example image below to get little idea about this icon collection. It's a beautiful collection of social media icons. Have a look at the icons in their official site. I am sure you like this Dark Denim icons. Almost all the popular and new social media icons is included in this set. Also, they keep their list updated with latest social sites. Simple Glossy is a silver color icons set. It also look cute as other icons in my list. The list is updated with all new social media icons like Google+, Pinterest, Twitter, Facebook and many more. See the picture collage below. As the name suggests the icons is in white color with gray feel. It has smooth rounded shape. This social media icons list is also updated with latest popular social media sites. Have a look at icons in the image below or you can view each icons in their site. It is available in PSD format. This is the second icons set in my list which has rounded corners. It has combination of blue and white color with pearl effect. Like the most social media icons sets in my list the author keep their icons list updated with latest social media site. So, you will definitely find your favorite social networking site in this icons set. Here is the first transparent social media icons set in my list. The list contains high quality icons and looks very good. You should take a look at the icons in the official site. The icons is available in PSD format. This set contains 20 popular icons list. It looks like the social media icons is crafted in crowns. It will be good icons for restaurants or shopping sites. Here is the little preview of this icons set. This is another transparent icons set in my list. It's different from previous set with glowing effect on the icons. If you blog on designing site than it will look great on that. You will be able to find your favorite icons in the list. To see the list of all icons than click on the Download Icons button below to go to the official site. Isometrica is a beautiful icon set. It also contains most of the social media sites icons. If you find your desired social media sites in the list than I am sure you will like this social media icons set. This icons set contains 154 social media icons which is of good quality and the icons is available in PSD format. The icons set contains 154 beautiful icons. The icons really looks clean. You can download the ZIP file and the PSD for free. This is very simple flat icons set. Some of the new social media icons is added to the list. But it doesn't contains all the social media sites icons. See the preview of the icons in the picture given below. It is a clean icons set with marker color style. It contains large number of icons in high quality. You can also download the layered PSD if you wish to design a icon of this style yourself. The icons in this set looks like glass with glowing effect of silver color. If you want to create additional icons yourself than you can also download the layered PSD. This set of social media icons is very large. It contains 108 icons in the set. You can download the zip file of the icons set. This is clean and polished icons set. The icons have little shadow in the footer. The set contains 104 clean designed icons. This set contains 36 beautiful fully layered social media icons. You can download the icons in PSD format. You can use this set for your personal or commercial purposes for free. Have a slight look at the icons collection below. Glossy is a black color social media icons set. The icons are available in PSD format. You can see the icons in the image below. New social media icons sets are also added in the updated list. The link button will take you to the download page. This one is also cleanly designed social icons. It contains two sets of icons, one with border and the other without border. I use this icons set in my site. Have a look at the social media icons of my site. This is the simplest icons set in my list. Social media icons in this set looks clean and sharp. Take a look at the icons given below. This icons set is available in .psd format. The icons are in round shape will little design. It is available in orange color with little yellowish effect. Now take a look at the demo icons list. This list of icons contains square shaped with smooth end social media icons. 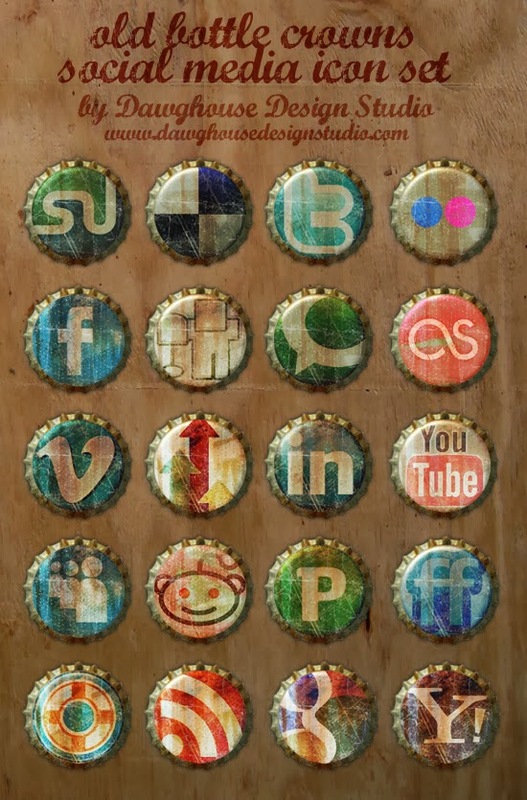 You will find almost all the new social sites icons and many of the old is also included in this icons set. This icons set contains 20 most popular social media icons. It is designed in 3D format. All the icons in this list have clean look. If you would like to use these icons than feel free to use these as you will not have to give credit links to the author sites. This is the last icons set in my social media icons list. As you can see in the picture given below these icons is in rounded shape. These are simple designed icons set and it is available in 3 sizes, 128x128, 64x64 and 32x32 pixels. Feel free to use these icons for personal or commercial purposes. These were the 30 free social media icons set. I hope you like these icons set. I wish you have found the icons of your choice. All the icons above is fully free to use.